Every driver has experienced the moment of shame when you turn on your wipers when it starts pouring rain only to realize once again that you forgot to replace them. Your car’s safety and efficiency can be dramatically increased by taking a few preventative measures. According to the Car Care Council, 84% of cars on the road are in need of service or repair. Most repair issues are related to engine oil, air filters, and coolant. Setting reminders, taking precautions, and being proactive about maintenance can prevent a life-altering disaster caused by a malfunction of your vehicle. Check Your Headlights and Brake Lights. Not only is it dangerous to drive with a headlight out, it is also illegal and can lead to a hefty ticket. Before you find yourself driving with one headlight out, check your lights, including your reverse lights, every few months. If you set a bimonthly reminder for yourself, simply include checking your headlights and brake lights in the reminder. Buy Good Tires and Rotate Them. Although it may be tempting to buy the most affordable tires in the store, it is highly recommended that you research your options and choose the best tires for the area you live in. Once you have purchased your tires, get them rotated regularly according to manufacturer’s recommendations. Check tire treads and inflation: Did you know that properly inflated tires can improve your gas mileage by an average of 3%? Keep a tire gauge in your vehicle to check it before any long drives. Some gas stations every give away air for free. With weather changes and fluctuations in temperatures, your tire pressure can decrease significantly overnight. Keep an eye on your treads to make sure they are not worn. Tire treads provide a vehicle with the traction it needs to stop slippage in hazardous weather. Pep Boys recommends the ‘penny test’. To test the tread of your tires, simply hold a penny with Abe Lincoln’s head upside down and put it in between the treads of the tire. If you can see the top of his head, the tread is low and it is time to invest in new tires. Stay Updated Concerning Potential Recalls: No matter the age of your car, manufacturer recalls can happen. Usually care owners are notified by mail about any relevant recalls but with multiple moves, inaccurate address information, and problems with the mail system you may never receive a written notice. Keep Up with Wiper Blades and Wiper Fluid:No matter the age of your car, manufacturer recalls can happen. Usually care owners are notified by mail about any relevant recalls but with multiple moves, inaccurate address information, and problems with the mail system you may never receive a written notice. Check Your Battery: A quarterly assessment of your battery charge can prevent you from experiencing the moment where you try to start your car after work and the engine does not turn. Any regularly scheduled tune-ups will check your battery for charge and any indication of calcification. Pay Attention to Illuminated Lights: In modern day cars, it seems like there are more lights than ever to indicate seemingly urgent problems with the vehicle. If any light comes on, consult your owner’s manual to determine the severity of the problem. A check engine light should never be ignored. Also, if there is any indication the light that is illuminated is related to a car’s computer systems it should be corrected immediately. Check Oil Regularly:Check your oil regularly, especially before a long road trip. It is estimated that 25% of vehicles on the road right now are low on engine oil. Your owner’s manual should show how to check your oil levels (some newer cars are not simple to check). Get Oil Changes Regularly:The owner’s manual of your vehicle should tell you how often you need an oil change. Mechanics will typically tell you or provide you with the mileage of when you are due for your next oil change. Following their direction expressly can drastically decrease your gas usage and will extend the life of your car. Don’t Keep Junk in Your Car: Bit by bit, you vehicle may be the dumping ground for junk you have been meaning to get rid of for a while. Added weight decreases your miles per gallon and creates a hazard if you are in an accident. This simple fix costs no money. Keep Your Windows Clean:Pets, children, and normal weather conditions are likely the cause of getting your windows dirty both inside and outside your vehicle. Cleaning your windows increases your visibility and helps you be a better driver. Don’t Leave Valuables in Your Car: This is more for your safety and to save you the hassle of replacing your windows or filing a claim for a stolen vehicle. Leaving valuables in plain view is a draw for thieves who want to make a quick buck. Protect yourself and your family by never leaving valuables in your car. Keep an Emergency Car Kit:No one can predict when weather will be bad or an emergency kit is necessary. An emergency car kit can also include a spare tire which is inflated for use. Every driver should have an emergency kit in their vehicle. Repair Your Weather Stripping:The seals for your windows and doors keep moisture, mold, and humidity out of your vehicle. Getting these seals repaired keeps your car safer, cleaner, and healthier. Consider Adding Updated Technology:When you get regular tune-ups, especially at the dealer, they may help you figure out the best way to improve your vehicle. Adding GPS, replacing your window motors, and more can make your vehicle safer. The three main benefits you reap from regular care and precautions with your vehicle are increased safety, better performance and fuel economy, and extended lifespan. Make minor changes to be safer in your car today. While regular vehicle maintenance is important for every driver, accidents can still happen…no matter how safe you try to be. If someone else’s neglect caused you to experience a traumatic event which also left you injured, contact a skilled car accident lawyer who cares today. 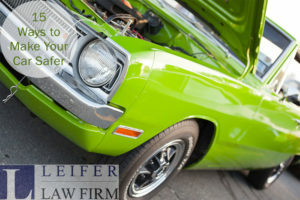 Leifer Law Firm serves clients in Boca Raton, Fort Lauderdale, and West Palm Beach. Contact our legal team today by phone at (561) 395-8055 to schedule an appointment to discuss your potential case.